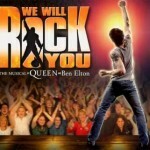 Everyone who loves the band ‘Queen’ and their songs, then this musical is perfect for you. It is filled with songs by them and the plot line is based around rock. In the Queen song-fest We Will Rock You, the action takes place in a futuristic world, Planet Mall, where rock music is banned. Globalisation is complete; everywhere the kids watch the same movies, wear the same fashions and think the same thoughts. Individuality is unthinkable… unless you are a rebel, a Bohemian, who lives in the underbelly and resists the world above. The Bohemians believe instruments still exist somewhere on Planet Mall, they just need a hero to find them. Is Galileo that man? We Will Rock You has a score which features many of Queen’s greatest hits including Killer Queen, Bohemian Rhapsody, Radio GaGa and the title track. We Will Rock You is currently in its 9th year at the Dominion Theatre.